A uric acid test kit can provide you with information about your uric acid levels. However, they are not suitable for everyone. You should think carefully, and consult your doctor, before buying one. 1. Read through the articles in the Gout Diagnosis section and confirm with your doctor that you do have gout, and not some other condition masquerading as gout. There is no point testing uric acid if your problem is pseudo-gout, septic arthritis, bursitis or some other condition commonly confused with gout. 2. Discuss your doctors uric acid test schedule and agree that you might get additional benefits from supplementing that schedule with additional tests. It is your doctors job to monitor your uric acid levels, and the frequency of your visits will be determined by the stage of your treatment. Additional testing should not be necessary, but you might want to consider it if you like additional information. 3. Convince yourself that you can learn and apply consistent strategies for using the meter in the exact manner described in it’s instructions. Uric acid test meters are not toys. These instruments need a consistent, adequate blood sample of the correct size which may take practice to achieve. 4. Order a Blood Uric Acid Kit from a reputable supplier, who offers money-back guarantees and product support. Different makes are popular in different parts of the world depending on distribution agreements. In North America, the EasyTouch Glucose / Cholesterol / Uric Acid Meter is popular. Widely available, including from Ebay.com, it combines uric acid testing with glucose testing for diabetes, and cholesterol testing. Each test requires that you buy uric acid test strips, and/or other appropriate test strips. If you are unsure of the benefits of owning your own uric acid meter at home, or if you need help in using one, please ask in the gout resources forum Please note that these links may include affiliate links that provide commissions on product sales. These commissions do not affect the price you pay, but they will help to keep this website running. Please remember that uric acid meters will not have any direct on your gout. You should only use them as part of a medically supervised plan to control your uric acid levels. I have used the UASure uric acid meter to monitor my uric acid levels during a weight-loss program with encouraging results. Users have reported good correlation with “official” lab results, however some users cannot consistently perform the necessary drawing of a correctly sized blood droplet and show inconsistent test results. 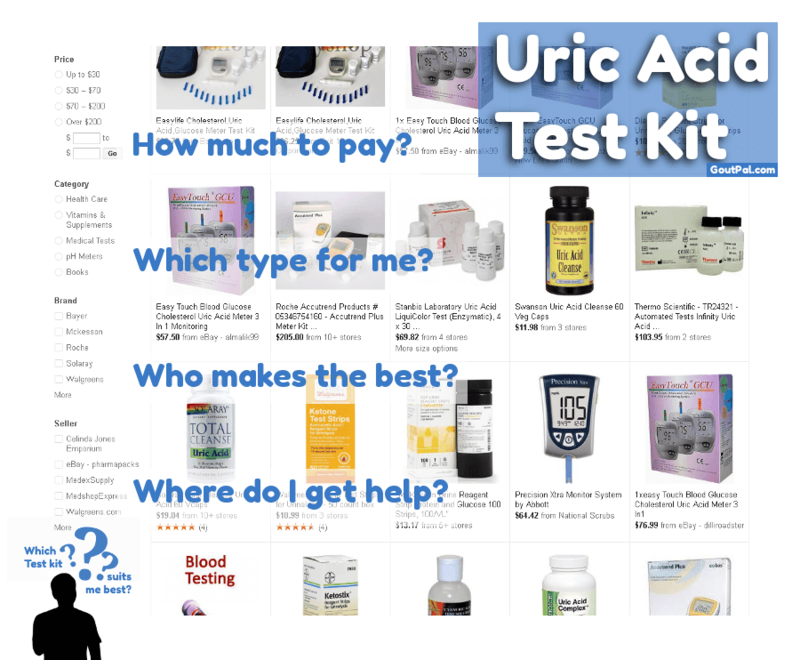 What do you need to know about Uric Acid Test Kits? AUTHORNAME. Uric Acid Meter. GoutPal Interactive. 11 July 2012. URL:gout-pal-forum/please-help-my-gout/uric-acid-meter/[now obsolete]. Accessed: 2012-07-11. Archived by Wayback Machine. Jul 03, 2010 (first archive). First Published. Jan 31, 2014 (archive). Reformatted for layout change. Sep 13, 2016 (archive). Featured image added. Flagged for review. If you have ideas about how this page can be improved, please add your comments to Review Uric Acid Test Kit. Jan 30, 2017 (archive). Archived reference  corrected. If you see other GoutPal pages that I should improve, please suggest a GoutPal page review.